In light of the holiday week, and that I have essentially zero time (or willpower) to write an actual post, here are some random facts brought to you by the lovely people at Pinterest. Sometimes it takes work to get my fantasy on, and this morning was no exception. My youngest decided I needed to be pulled out of bed five minutes before the alarm for his morning bottle, and that I needed to hang out with him while he snuggled in his blanket on the couch. Today also marked the start of school for my older two kids after being off track for the past two weeks, which means a school morning, which means rush and hustle and arguing and all that stuff that we’ve avoided for two weeks. After all that I needed a little escape from reality. This is where a short foray on Pinterest is very helpful. I put “fantasy” in the search and allow the software to deliver hundreds of examples of fantasy art and places. You can also follow the fantasy boards of pinners you like for a more customized experience. Anything inspired by Lord of the Rings, and especially the art of Alan Lee is bound to get my attention. I love the attention to detail and the fantasy armor. Again, the attention to detail here is remarkable. There is a story here, he is protective of her, she trusts him. A little romance is good for the soul. Love it! With everything else going on in my life, chances are I’m not going to be able to take a flight around the world anytime soon to seek out inspiration from places that are similar to the settings featured in my book. Medieval castles and villages are hard to come by here in the West. The oldest things around here are indian cliff settlements which while fascinating, aren’t what I need. I’m lucky in some ways, mountains and forests do feature prominently in by book and I happen to live within one of the most stunning mountain ranges in the US. They don’t call them the Rocky Mountains for nothing. For everything else I’m stuck with the wonders of the internet and I have to admit I’m getting pretty good at finding pictures and videos that help me better envision the places my characters find themselves. If you would like to check out a few of the things that inspire me, check out my Inspitation for Writing Pinterest board. 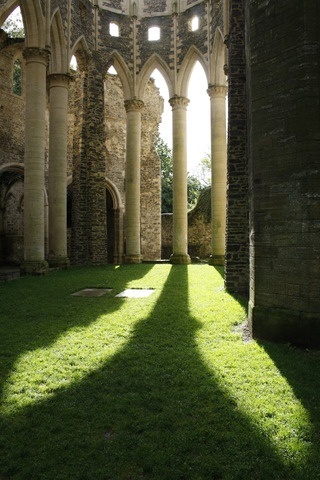 Hambye Abbey – I love the pillars and the play of light across the grass. It was one of those long stretches of summer afternoon when it was too hot to go outside. The kids slid around the house, skulking, with nothing better to do than pick fights with each other and in general, drive me nuts. Days like these scream for distraction and that day a movie wasn’t going to cut it. I scanned through my “Gonna try this” folder on Pinterest and saw a post about salt dough. Perfect. It’s creative, it’s quiet, it’s unplugged, and even better, I had all the ingredients. My kids, like most kids, love play dough. When they play it’s a whole body sensory experience. The dough ends up ground into their clothes, hair, crumbled all over the floor, and mushed into the carpet. If it were cleaner, I would do it more often. So, we made salt dough and I set the kids to the task of making dough people. Soon the house was filled with laughing once more as they posed and dressed their creations. One of the perks of salt dough is that once it dries it can be painted. Usually this process takes several days of air drying, or several hours in a warm oven. I’m not that patient. Plus, I read that salt dough can be speed dried in the microwave. Dough boy got nuked and turned out great. Once he had cooled off he was indeed dry and ready to paint. Dough girl was a different story. She was long and thin with narrow delicate limbs. Dough boy was stocky and thick. It wasn’t until I smelled the panic inducing smell of smoke that I realized my mistake. Dough girl was on fire. 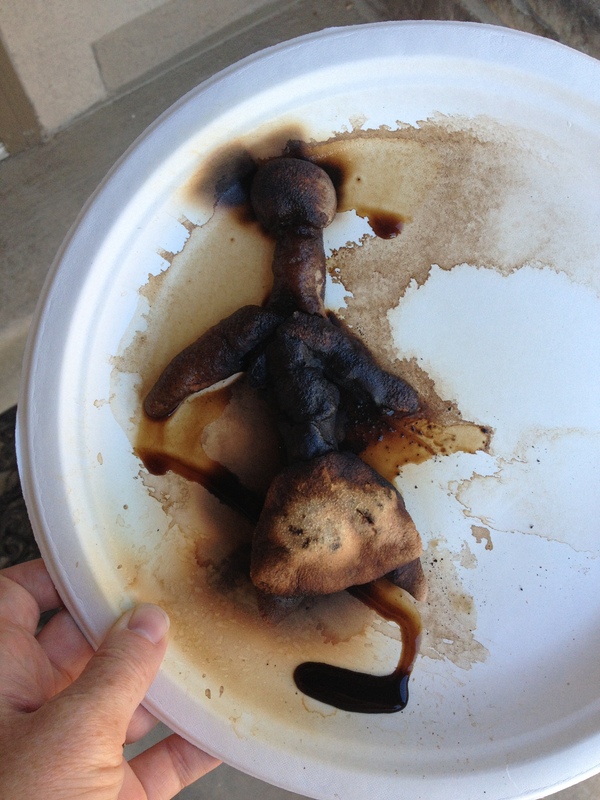 I grabbed the plate and ran her outside, hoping to minimize the amount of smoke that filled the house. But it was too late. The whole house reeked of burnt flour, which is oddly similar to the smell of burnt popcorn. I braced myself for the tantrum that was sure to follow. It didn’t come. Instead, I found my daughter doubled up in laughter. She thought the whole incident was hilarious! There was enough dough for her to make another, and this time I made sure not to light it on fire!